On property golfers will find a pro shop stocked with golf accessories and attire, the Eagle Crest Grill and lounge open for breakfast, lunch items and beverages, men's and ladies' locker rooms with showers, and banquet/outing/special events facilities that can accommodate 144 people. The elevated grass range sits just in front of the clubhouse and a putting green sits to the right - easily accessible from the pro shop as well as from the Marriott Resort. Some sprinkler heads are marked, and 150-yards stakes are visible on the par fours and fives. A brochure with hole diagrams and tips on how to play each hole is also included with paid green fees. At 6755 yards the championship tees play to a formidable 138 slope, and the blue tees are no slouch either with a 135 slope playing to 6470 yards. 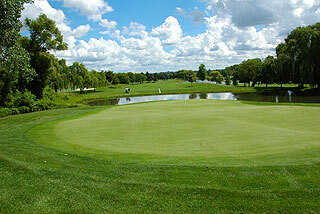 Most golfers will opt for the white tee boxes, which measure 6150 and are sloped at 131. The forward tees measure 5185 yards and play to a 124 slope. A rolling terrain with frequent water hazards and medium sized, undulating greens will demand a good iron game to score well. 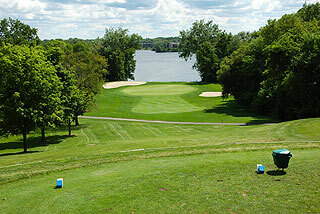 There are some pretty unique and challenging holes - along with some that present beautiful views of Ford Lake. The opening hole begins from an elevated tee and turns to the right, with mounding on that side separating the fairway from the nearby range. The left center of the fairway about 100 yards out will leave an opportunistic approach over water, with a cascading stream to the left and bunkers right. Number two doglegs left about 60 degrees near the 150 yard area. The tee shot here must breach the 180 yard area to the right center, or face a blind approach to a green bordered by a pond immediately left and Ford lake right. The 100 yard area is the place to be on three, which leaves a second shot over water. The fairway ends about 60 yards out. 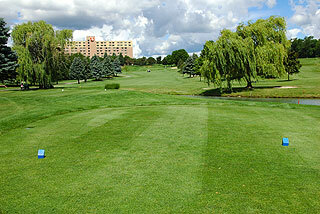 There is room everywhere but left on the par three fourth, which precedes the most difficult hole of the layout. On the par five 5th the left center is the place to be on the first two shots, as the fairway slopes downward and left to right from 150 in. 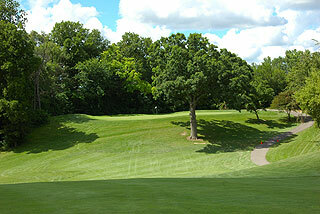 Trees on the right prevent a cut, and the huge trap that fronts the green presents another challenge. Level areas to the right make that side the primary target on the par three 6th, which angles right to left. Though out-of-bounds looms along the right, the fairway on seven is generous and plays uphill to a double tiered putting surface. A tee shot placed just left of the fairway bunker on eight will leave advantageous positioning, and a good opportunity for par or better on this short par four. Grip it and rip it off the tee on nine, which is a mid-range five par that can be reached in two by long hitters. This holes turns to the right near the 250 yard area. There is room short and to the right, but long is gone. The back side plays a bit longer and has some rather tricky doglegs. Ten is a risk/reward par five with the left center being the safe way to go. A tee shot shaped left to right that clears the tree line and lands between the 150-200 yard area can really cut off some distance - and provide a good eagle or birdie opportunity. For those laying up the area short left of the green is good place to be, as a bunker right front and pines behind and on the sides of the putting complex make going for it in two risky.Eleven is likely to extract some four letter words from golfers playing this hole for the first time. The best tee shot will land in the 140-150 area left of center. A depression on the right will leave uneven lies, and anything hit short will face what looks like an impossible, and somewhat blind approach to a perched green protected by a huge tree in front. The 12th is a long par four set in a lush environment, with plenty of trouble on both sides of the fairway. The fairway slopes left to right and the green is very long and narrow. 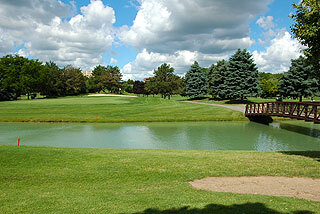 A lake left of the cart path borders a wide fairway on 13, that ends with a pond fronting the green about 50 yards away. There is room to error left of the putting surface on the approach, and all else is trouble. From layered, elevated tees golfers will find a beautiful par three with plenty of room short. The tee shot on 15th is a demanding one, as the water along the left creeps in towards the fairway near the 80 yard area on the way to the green. Sixteen begins from raised tees and demands a carry over marsh land that breaches the 270 yard area. The fairway begins here, then ends abruptly about 50 yards away as an inlet from Ford Lake fronts the putting complex, that is defined by a rock retaining wall. 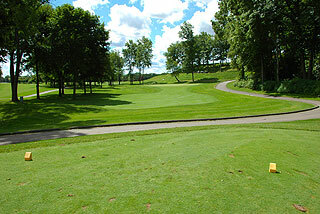 The large sand trap to the right of the green saves many tee shots from reaching the hazard on the long par three 17th. The left side is the obvious target here. The 18th fairway plays uphill and leads to an elevated, two tiered putting complex with bunkers in front and back. 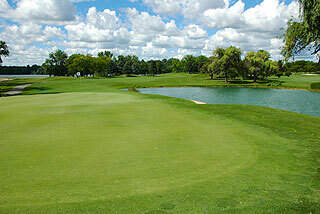 Eagle Crest is the type of course most golfers will want to play again...right away. 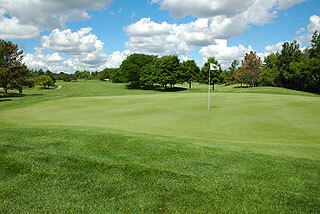 The layout rewards good shots and good strategies, and course knowledge is a definite advantage. Pay attention to the GPS and to the "tip sheet". The conditioning was excellent on our visit, the service friendly and the course interesting. The property is easily accessible just off I-94 at the Huron Street exit in Ypsilanti - close to Ann Arbor and just a short drive from Metro Airport. For more information, visit our page for the Eagle Crest Golf Club, with link to their website, by clicking here.